Lower your E55 by 20mm/ 0.8" for 80 cents! Location: CA, FL & TX. For those who have done this…what happens when the car is up to speed and it decides it wants to lower its self? It will lower itself another 0.6 inches. My guess is the shocks will probably start bottoming out at speeds over 75 when it's that low, kind of like if you lower a car equiped with springs and use the oem shocks it will leak in no time no matter how you want to rationalize it. I think your totally wrong. 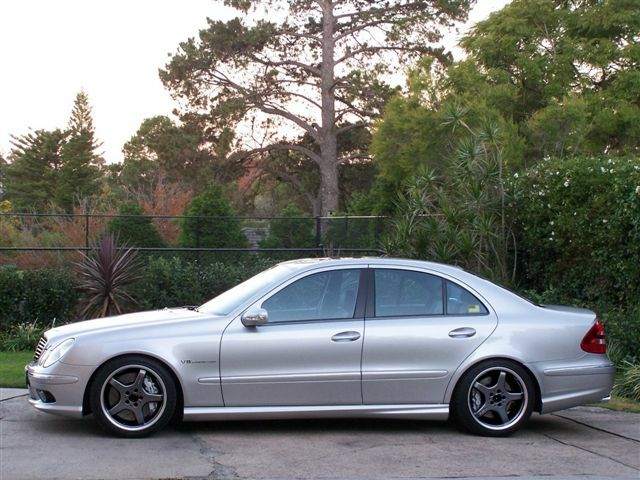 you don't understand how the suspension on the E55's works, better do some research. lowering the car this way I bet, is with in the mbz specs. though I would rather lower using star dig this would be a close 2nd and no one should worrry about it. just do it right and use lock tight etc. I know you want me to explain the suspension inner workings etc but dvinn is just guessing in his post, he just doesn't like the idea of lowering the car this way and is grasping at any theory to back his beliefs up. no theorys here just common sense. Lock-tight should make things OK. I really was just wondering if with this “$.80 lowering thing” if you lower it…a lot…would the .6inch auto lower at speeds, cause a safety issue with front wheels steering. yea if you lower it A-LOT. it would rub. i know you get it. it just a funky way of lowering the car. and everybody's "heard" of a problem with this but has anyone talked to a owner of a car that did this and it failled? basically its the people who have bought lowering mods from brabus and such who heard these rummors from people who sell these modules and they help spread the word so the vendors can sell more expensive *** modules that fu$k up your warranty anyway! Actually I would like to hear the inner working differences of the airmatic between E500 and E55 too. I don't think it's any different but if you know how it is different why not share it with us? Also as to your reference to "within mbz spec" I wonder what you use to figure that. I don't think lowering with spacers is a good idea, using star diagnoise should be your 1st choice even lowering moduels would be better than using spacers. Just like a hub centric wheel with the right offsets is always better than wheels using center rings and spacers. At least with computer lowering you can control exactly how much to lower and when NOT to lower. If you lower by .8", chances are with spacers you are over 1" and airmatic lowers it by .6" at speeds that makes it almost 2 inches lower. On E55 how much ground clearance are there left with a 2" drop? Not much! and if you hit a pot hole or a not so smooth surface going over 75 mph, it won't look good to your components. would you have to do both sides on the front or just one side? uhhhh paragraph 1 response-- didn't know we were comparing 55's w/ 500's? but if you want to know there exactly the same. 2nd mbz spec? i'm guessing from experience. and you agree w/ me on the rest. Last edited by BMWEATR; 05-14-2005 at 12:41 AM. I think BMWEATR is right, we've all "heard" of the problems, but it seems the only people that can confirm problems are folks that spend mad $$$$ on lowering modules and end up with uneven ride height. Does the same technique apply to an E500? I have a E500 that just sits around I would like to try this on, before I try it on my E55. What I was refering to E500 & 55 airmatic was your comment you made here. When you tell somebody they don't understand about something usually means you know something they don't, so that's why I asked if you can elaborate more. But seems like you know about airmatic just as much as me so it's ok. I do agree lowering with any method will be fine as long as your happy with the outcome. Yes it is the same way to do it, as the pictures posted before is from a 500. I have had my car lowered using this technique for almost a year with no problems. There also some brackets by TWS for about $150 that do essentially do the same thing (i.e., move the sensor arm to trick the sensor). Someone makes one for the rear as well. The lowering modules do it electronically, while the bracket and/or washer technique does it mechanically. I have the TSW brackets in the front, but put a couple more washers in to lower it more. Bought a packet of washers and lowered the front today. REALLY easy, you where right. Took less than an hour. Put in 2 washers - about 3mm thick - front down about 10mm. Looks better. Had to grind the sides of the washers straight so that they would fit snuggly in the bracket (could have bought smaller washers but the grinder was more fun and easier). I'll think about the back now, but with the front 10mm drop its not imperative. I just drove the car - its now down 20mm!!!!!!!!!!!!!!!!!!!!!! TWS has both the front and rear i think.. I'm sure if a few of yous do a group buy they would prolly drop the price down.. The only reason to buy a front link is if you want more than 25mm lowering. For under $1 (any currency) you can do the front yourself. Now do the rear. It's even more fun. Once you've ground two 10mm long notches, you can move the sensor up and down to experiment with any rear ride height you wish within that range. Did you use a Dremel or something else? Did you put the car on ramps or jack/stands? I bought a cordless Li-Ion Dremel. You will need at least two or three thin grinding bits for the two holes. Don't even try filing the notches out with a needle file - it will take longer than trying to escape from Alcatraz! The steel is veeery hard, indeed! Quick Reply: Lower your E55 by 20mm/ 0.8" for 80 cents!